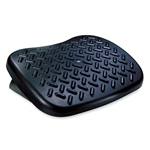 TarsalRest Adjustable 3" Vinyl-Matted Footrest- improve your posture and health. TarsalRest Adjustable 6" Vinyl-Matted Footrest- reduce strain on your legs and back. Improve your posture and overall wellness with the FR140 footrest.